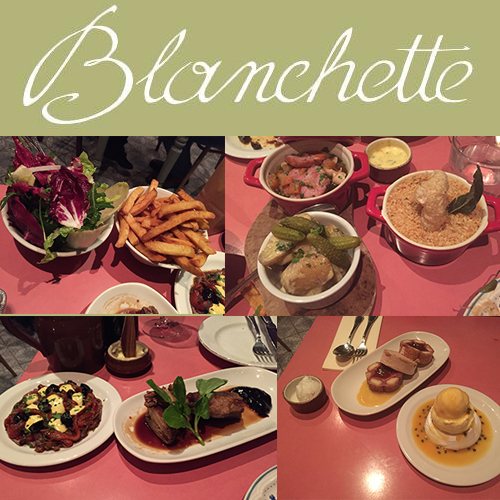 Blanchette is a French bistro run by three brothers, serving simple, classic and inventive French food. The concept is based on the idea of sharing small French family dishes with charcuterie plates, homemade terrines, oysters, cheese, whole roasted chicken and apple tart. A fine selection of drinks, such as French wine and organic cider is also available. We enjoyed Chicken and Morteau Sausage ‘Pot-au-feu’, ‘Middle White’ Pork Toulouse Cassoulet with Crackling, Confit Duck Leg with Cep, Potato Dauphinoise and Redcurrant Jam, Warm Marinated Rib Eye with Charred Red Peppers, Vermouth and Ailoli, Frites and Bernaise, Mixed Leaf Salad and Passion Fruit Vacherin. Blanchette is a beautiful little cafe near Oxford Street and Soho, with friendly service and a Parisian vibe. It’s the kind of place I can imagine going for a few drinks and some nibbles with friends during the summer months (and I think that is completely the vibe it is going for). If you like French food then this place is certainly worth checking out.